is only $2.99 at the moment, so it's a great time to grab this title! You can read it on ANY device, by the way. I have the Kindle App loaded on my iPad, Droid Ultra phone, and each computer. IMTW was a lot of fun!! I mentioned I'm starting TWO podcasts. I'm starting a new low carb podcast (I had one previously with a partner). I already have the awesome Blue Yeti mic, which I use for webinars and interviews and such. It's GREAT. I also got Evaer for doing awesome Skype Video interviews with side-by-side video - which also captures the audio to use for your podcasts at the same time. Ah, I mentioned YouTube and "video podcasts". I'm planning to bring my vlog back, and I'm also kicking off my Low Carb YouTube channel this year too (finally!). 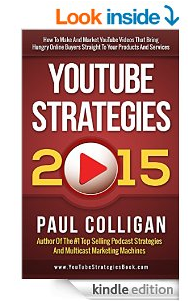 I noticed on Paul Colligan's Amazon page that he also has YouTube Strategies 2015 out on Kindle for less than $10. I decided to grab that too. 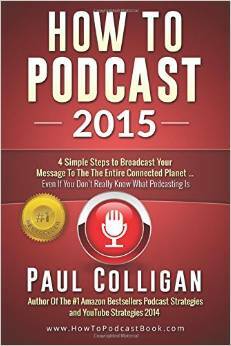 You really can't go wrong with two current strategy guides on Podcasting & YouTube marketing for only $12.98 total. Even if you get the paperback version (which is what I have)... it's STILL worth it! Anyway, just a quick announcement, and a great deal on both books. YouTube and iTunes are both GREAT ways to increase your reach, and expand yourself to get in front of even more people in your market. If you're not ROCKING both channels... yet ... why not?! I've found myself listening to more podcasts again recently so this is fairly timely for me. I can imagine at some point again soon I'll be bitten with the bug to do my own. I have my first big webinar coming up and can probably use some of these ideas on that as well. Thanks!